Elite Woodworking began manufacturing cabinet doors and drawer fronts in 1990 in Phoenix, Arizona. The owner, Dan Walker received his apprenticeship from Wilson Custom Cabinets also in Phoenix in 1982. During that time, Dan manufactured custom cabinets and cabinet doors exclusively for residents in the Pinnacle Peak area in north Scottsdale, Arizona; as well as the Phoenix area. Dan completed his apprenticeship in 1988 and worked for a small custom cabinet company for an additional two years. In 1990, Dan elected to open and create Elite Woodworking, a custom cabinet door manufacturer in Phoenix, Arizona. Over the years, Dan is considered to be an expertise in the woodworking business. Elite Woodworking is a family owned business. During our inception, Elite Woodworking rented a small space within an existing cabinet shop in Phoenix. During that time, Elite Woodworking was building and creating cabinet doors for the existing cabinet shop, as well as, other cabinet shops in the area. Elite remained in the small rental space with 2-10 employees. In 1999, Elite Woodworking moved to our existing Melinda location in Phoenix. We are proud to employ talented men and women who are gifted craftsmen and servicing over 100 cabinet makers and private individuals of Arizona. Elite encourages our employees to use their creativity to help design, learn and grow in the woodworking business. We also provide our employees with an educational experience, as well as, providing the finest quality of craftsmanship to our customers. 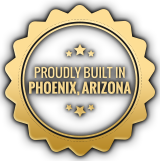 We are proud that our doors are built in Arizona. At Elite Woodworking, we support Habitat for Humanity. We are continually looking at the eco-friendly lumber for your home or office. We offer advice and suggestions relating to wood products when placing eco-friendly jobs. Elite Woodworking manufactures top quality custom cabinet doors and drawer fronts. We guarantee that we will meet your size and specifications as well as offer you various assortments of styles. We want our customers to feel secure in knowing that your custom order will always be done to the best of our ability – ensuring the highest quality of craftsmanship. To get more information on the custom cabinetry that we produce at Elite Woodworking, give us a call at 623-780-2724. You can also reach us with any custom cabinetry questions that you may have through the Contact Us page. Fill out a PDF and fax it to us!